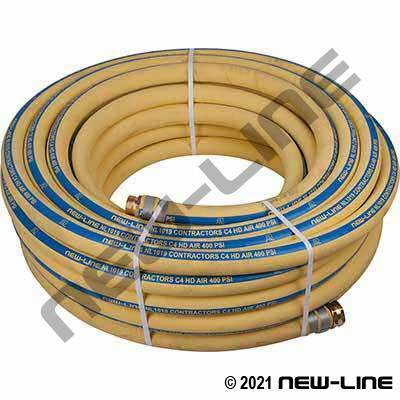 NL1019 is a versatile heavy duty air hose for mining, construction, and other industrial applications up to 400psi (however most fittings and clamping methods do not permit such operating pressures). It can also be used as a heavy duty washdown hose on docks or in mills. Our NL1019 is made from higher grade compounds as compared to other more economical yellow air hoses on the market; its cover provides good handling integrity and grip while resisting standard abrasion, weathering, and gouging. Its tube is resistant to heat and moderate oil mist (RMA Class C petroleum based mist, do not use this hose with vegetable oil or mineral oil). Popular assemblies are listed below. Construction: Tube: Black SBR/NBR rubber blend. Cover: Wrapped, yellow SBR/EPDM rubber. Reinforcement: Synthetic yarn.